FKLI futures June contract surge 8.5 point higher to close at 1076.5 as compare to previous trading session with total 5,499 lots traded in the market. FKLI continue to surge up mainly due to Dow Jones electronic trading and regional indices continue search new high during trading session. 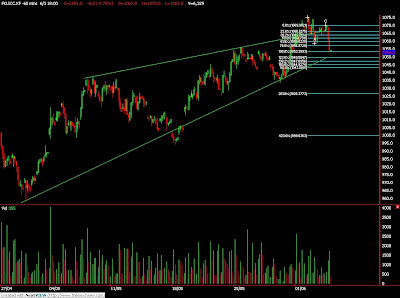 Technically, FKLI searched for new high during the trading session after supported around 1050 support regions. Based on our technical knowledge, our opinion still suggest that FKLI would trade lower in the coming trading session provided resistance level around 1081 and 1093 were not violated. 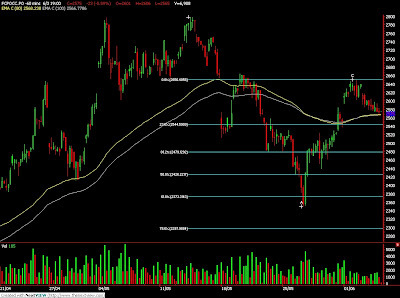 Traders were advice to hold short position in the coming trading session while support levels were seen at 1050 and 1033.5 regions. FCPO 3rd month August Futures contract fall RM49 lower to close at RM2520 levels as compare to previous trading session with 10,734 lots traded in the market. CPO price was traded lower as soybean oil and crude oil electronic trading plunge during trading session. 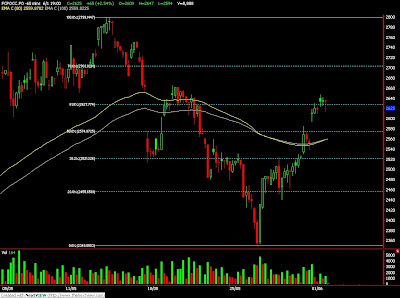 Technically, CPO price manage to rebound 61.8% Fibonacci retrace levels at RM2600 regions. Based on our technical studies, our opinion suggest that CPO price would continue to trade lower in the coming trading session provided resistance levels at RM2610 and RM2650 must not be violated. Traders were suggest to hold short position in the coming trading session while be cautious around support levels at RM2511 and RM2484 regions. June 5 (Bloomberg) -- Oil companies must increase investment in production to prevent a surge in crude prices that may outstrip the records of last year, according to industry executives and officials. Declining investment will naturally lead to production declines, making a Saudi prediction of oil at $150 barrel “realistic” within three years, Russian Deputy Prime Minister Igor Sechin said at the St. Petersburg International Economic Forum today. Crude has fallen more than 50 percent since reaching a record of $147.27 a barrel in July last year as demand has declined in the world economic turmoil. Global investment in the oil industry may drop by as much as 21 percent this year, Sechin said, citing International Energy Agency estimates. Should companies fail to invest, a demand crunch could drive up the price to $160 or even $200 a barrel, BP Plc Chief Executive Tony Hayward said, answering a question about surpassing last year’s prices. Hayward was at a session on the oil price attended by executives including OAO Gazprom’s Alexei Miller, who last year said oil might reach $250 a barrel. Oil for July delivery traded for $68.88 a barrel, 7 cents higher on the New York Mercantile Exchange at 12:18 p.m. London time. The energy executives present said a fair price for oil would be $70 to $80 a barrel in an interactive vote. OAO Lukoil CEO Vagit Alekperov said there were no fundamentals for oil to rise higher than $70 a barrel or fall below $40. Demand isn’t stagnant because of continuing urbanization and growing population, Hayward said. A lack of investment is the main problem and it’s essential to avoid an energy crunch in the next two decades, Nobuo Tanaka, the IEA’s executive director said. While oil demand may not return immediately after the global economy recovers, fossil fuels will still account for 67 percent of energy until 2030, he said. Long-term contracts would remove economically ineffective intermediaries in trade, cut transport costs and help stabilize prices, Sechin said. Oil producers should consider moving pricing from the U.S. dollar to a “multicurrency” approach to reduce currency risk, said the deputy premier, who is also OAO Rosneft board chairman. June 5 (Bloomberg) -- The premium for soybeans at export terminals near New Orleans widened relative to Chicago Board of Trade futures, as a drop in prices discouraged U.S. farmers from selling supplies from last year’s harvest. The so-called spot-basis cash bid, or premium, for soybeans moved by barge this month to ports along the Gulf of Mexico was 60 cents a bushel above July futures, the U.S. Department of Agriculture said. That was up from 57 cents to 61 cents yesterday, USDA data show. Before today, the average premium fell 19 percent since reaching a three-month high of 73 cents on May 20, the USDA said. Soybean futures for July delivery fell 4.5 cents, or 0.4 percent, to $12.255 a bushel in Chicago. Still, the price rose 3.5 percent for the week, capping a sixth-straight weekly gain. Earlier, the most-active contract rose to $12.365, the highest since Sept. 4. Futures rose this week on increased investor demand for commodities as a hedge against inflation as global economies recover, reducing U.S. inventories to the smallest ever, Roose said. U.S. soybean inventories on Aug. 31, before the harvest, will drop to 130 million bushels, or 4.3 percent of estimated annual usage, down from 205 million a year earlier, the USDA said May 12. The government on June 10 will update its stockpile estimate, which Roose expects to fall closer to 110 million bushels. Total sale commitments by U.S. exporters for delivery before the end of August are up 12 percent to almost 1.24 billion bushels, compared with a year earlier, and have matched the USDA forecast for the entire season, government data show. As of May 29, sales not yet shipped totaled 163 million bushels, up 24 percent from a year earlier, the USDA said yesterday in a report. Processor bids in central Illinois, near Decatur-based Archer Daniels Midland Co., were steady at 25 cents to 40 cents over July futures compared with yesterday, USDA data show. The bid has risen from 10 cents to 25 cents a month earlier, even as futures rose $1.245 a bushel, or 11 percent, during the same period. Processor offers for sales of animal feed made from the oilseed were also steady at $20 to $28 over July soybean-meal futures on the CBOT, compared with yesterday. The price for meal sent by truck has risen 13 percent to an average of $420 for 2,000 pounds, compared with $372.50 a month earlier, USDA data show. About 48 pounds of animal feed is produced from a 60-pound bushel of soybeans. Profit margins for Illinois soybean processors have risen 26 percent to an estimated 87 cents a bushel this week, up from 69 cents at the end of April, USDA data show. Margins are the best since early November. June 5 (Bloomberg) -- Crude oil fell from a seven-month high after the dollar strengthened on a government report that the U.S. lost fewer jobs in May than forecast. Oil declined as the U.S. currency rose against the euro and yen, reducing demand for commodities as an alternative investment. Prices climbed above $70 for the first time since November after the Labor Department’s payroll report signaled that the worst of the economic slump may be over. Crude oil for July delivery fell 37 cents, or 0.5 percent, to settle at $68.44 a barrel at 2:50 p.m. on the New York Mercantile Exchange. Futures touched $70.32 today, the highest intraday price since Nov. 5. Oil increased 3.2 percent this week and is up 53 percent this year. The dollar advanced 1.5 percent to $1.3964 per euro from $1.4183 yesterday. The U.S. currency gained 2.3 percent to 98.79 yen, from 96.58 yesterday. It touched 98.89, the highest level since May 11. U.S. crude oil supplies rose last week as fuel consumption tumbled, an Energy Department report on June 3 showed. Stockpiles climbed 2.9 million barrels to 366 million, according to the Energy Department report. The gain occurred as imports jumped 9.9 percent and refineries increased operating rates to the highest in six months. Fuel demand fell 900,000 barrels to 17.7 million barrels a day last week, the lowest since May 1999. Oil demand may not return immediately after an economic recovery, according to Nobuo Tanaka, executive director of the International Energy Agency. It’s essential to avoid an energy crunch in the next two decades and the main problem is a lack of investment, he said today at a conference in St. Petersburg. The Paris-based IEA advises 28 developed countries on energy policy. The IEA, Organization of Petroleum Exporting Countries and U.S. Energy Department cut their projections for 2009 global crude-oil demand in reports last month. A V-shaped recession is one with a swift decline and recovery. OPEC agreed at three meetings last year that the 11 members with quotas would cut output by 4.2 million barrels a day. The 11, all except Iraq, pumped 25.76 million barrels a day in May, 915,000 more than their target, according to a Bloomberg News survey. Production is down 3.46 million barrels since September when the first cut was announced. Oil may decline next week on speculation that U.S. stockpiles will increase. Twenty-three of 34 analysts surveyed by Bloomberg News, or 68 percent, said futures will fall through June 12. It’s the most bearish response since February 2008. Seven respondents, or 21 percent, forecast that oil prices will rise and four said the market will be little changed. Brent crude for July delivery declined 37 cents, or 0.5 percent, to end the session at $68.34 a barrel on London’s ICE Futures Europe exchange. Futures touched $69.91, the highest intraday price since Oct. 21. Crude oil volume in electronic trading on the Nymex was 583,278 contracts as of 3:07 p.m. in New York. Volume totaled 600,760 contracts yesterday, 19 percent higher than the average over the past three months. Open interest was 1.24 million contracts. The exchange has a one-business-day delay in reporting open interest and full volume data. June 5 (Bloomberg) -- The dollar advanced the most against the euro since April and rose to a four-week high versus the yen after a U.S. government report showed employers cut fewer jobs last month than economists forecast. The greenback climbed against almost all of the other major currencies as a slower deterioration of the labor market supported bets dollar-denominated assets will gain as the U.S. leads the global economy out of a recession. The yen fell versus the Australian and New Zealand dollars on speculation investors will increase purchases of higher-yielding assets. The dollar appreciated as much as 1.8 percent versus the euro, the biggest intraday gain since April 27, before trading at $1.3966 at 4:01 p.m. in New York, compared with $1.4183 yesterday. The dollar rose 2.4 percent to 98.85 yen, from 96.58, after touching 98.89, the highest level since May 8. The euro climbed 0.8 percent to 138.01 yen from 136.97. The trade-weighted Dollar Index increased today as traders added to bets demand for assets denominated in the greenback will rise in an economic recovery. The measure used by the ICE to track the dollar’s value against the euro, yen, pound, Canadian dollar, Swiss franc and Swedish krona advanced 1.9 percent this week after last month’s 6.4 percent decline. The dollar fell earlier this week to its lowest level in 2009 against the euro on concern the quadrupling of the U.S. government’s budget deficit this year would sap demand for Treasuries among overseas investors and central banks. The Australian and New Zealand dollars rose against the yen for a fourth time in five days on bets the U.S. payrolls report will spur carry trades, in which investors borrow funds in a country with low interest rates and buy assets where returns are higher. The target lending rate of 0.1 percent in Japan compares with 3 percent in Australia and 2.5 percent in New Zealand. U.S. job cuts slowed to 345,000 in May, fewer than the revised decrease of 504,000 in the previous month, the Labor Department reported today in Washington. The median forecast of 76 economists surveyed by Bloomberg News was for a 520,000 reduction. The unemployment rate rose to 9.4 percent. Japan’s currency fell 0.7 percent to 61.66 against the New Zealand dollar and 0.9 percent to 78.17 versus the Aussie. Canada’s dollar, known as the loonie, slipped 2 percent to C$1.1190 versus the greenback as a Canadian government report showed the economy lost jobs for a sixth time in seven months, pushing unemployment up to 8.4 percent. The loonie fell 2.5 percent this week against its U.S. counterpart. The dollar also gained against the yen on speculation the Federal Reserve will raise interest rates later this year, reducing the cost advantage of borrowing in the U.S. to fund purchases elsewhere. Traders added to bets the U.S. central bank will increase its target rate for overnight loans between banks, now in a range of zero to 0.25 percent, by its November policy meeting, according to futures traded on the Chicago Board of Trade. The contracts show a 67 percent chance of a rate increase at that meeting, compared with 24 percent odds a week ago. 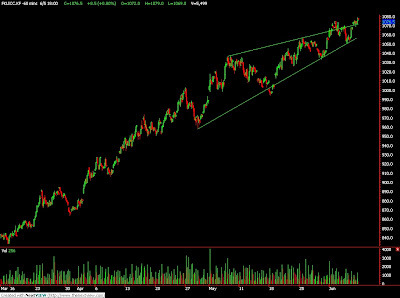 The euro’s decline against the dollar may extend for the next two to four weeks provided the 16-nation currency breaks its five-week trend support line by falling below $1.3885, Andrew Chaveriat, a technical strategist at BNP Paribas SA in New York, wrote in a note. “Euro-dollar is currently suffering the biggest short-term downswing since the April rally began,” said Chaveriat, citing the end of a rising trend that began May 18 and the euro’s decline below support at $1.3995, the 24 percent retracement of its gains since April. Support is a level where orders to buy or sell a currency may be clustered, and trends are patterns traders identify on charts that describe a currency’s path higher or lower. The pound traded near its lowest level this month against the dollar as Prime Minister Gordon Brown rearranged his cabinet amid calls for his resignation. Sterling slid 1.2 percent to $1.5977 after touching $1.5941, the weakest since May 29. It briefly erased its decline as the U.S. jobs report spurred speculation that demand for Britain’s assets will rise. June 5 (Bloomberg) -- India, the world’s biggest buyer of vegetable oils after China, must increase the benchmark import price of refined palmolein to prevent a glut of imported edible oils, the country’s second-biggest buyer said. An increase in the tax may help cool this year’s 52 percent rally in global palm oil prices. The tropical oil has surged as soybean crops decline in Argentina, and stockpiles in the U.S. are forecast to reach a five-year low. Palm oil competes with soybean oil for applications in food and fuel. Palm oil for August delivery on the Malaysia Derivatives Exchange added as much as 1.6 percent to 2,611 ringgit ($746) a metric ton, putting the commodity on course for a weekly gain. Futures were at 2,581 ringgit at the midday break in trading, up 0.8 percent for the week. Benchmark prices, also known as tariff value, introduced to prevent traders from paying lower taxes by understating edible oil prices, are meant to be revised to reflect global prices. Still, the government hasn’t changed them since August 2006 to ensure supplies to the nation’s consumers. The tariff on refined, bleached and deodorized palmolein is $484 a ton, while the average cost at Indian ports in April was $803 a ton. India may slow edible oil imports after stockpiles probably climbed 55 percent to 1.7 million metric tons in May, exceeding normal levels of 1.1 million tons, Govindlal G. Patel, director of Dipak Enterprise, said June 2. Purchases surged 82 percent in the six months to April 30 after the government scrapped import tax amid a decline in local oilseed output. India in March ended a 20 percent tax on imports of crude soybean oil four months after it was imposed to shield oilseed growers. Crude palm oil can still be bought tax-free. “It will be a logical step for the government to impose a 15-20 percent duty on crude palm oil,” Chaturvedi said. Imports of refined edible oils, mainly RBD palmolein, made up 15 percent of the 4.09 million ton total in the six months ended April, the Solvent Extractors’ Association of India said. India buys palm oil from Indonesia and Malaysia, and soybean oil from Argentina and Brazil. Palm oil accounts for almost 90 percent of all edible oil imports. June 4 (Bloomberg) -- Oil prices are likely to rise to between $70 and $75 a barrel by the end of this year because of expectations for an economic recovery and a weak dollar, OPEC Secretary General Abdalla el-Badri said. The Organization of Petroleum Exporting Countries has seen a pick-up in demand from China though the global economy isn’t recovering as fast as the price of oil, he said today at an energy forum in London organized by Bloomberg LP, the parent company of Bloomberg News. Goldman Sachs Group Inc. forecast today a surge to $85 a barrel by the end of the year. Crude oil for July delivery rose as high as $67.38 a barrel today on the New York Mercantile Exchange. OPEC, responsible for 40 percent of global crude supply, decided at its most recent meeting last month to keep production steady in case new supply cuts jeopardized the economic recovery. As of last month, OPEC completed 78 percent to 80 percent of a 4.2 million barrel-a-day output reduction announced late last year. A Bloomberg survey of May production showed a rate of 78 percent, down from an estimated 90 percent in April. While reaching full compliance isn’t technically practical, a rate of 90 percent “can be achieved,” el-Badri said. OPEC wants to reduce inventory levels to 52 days’ worth of consumption from 62 days, for which it will need to remove the remaining 900,000 barrels a day of its announced cut. Eliminating this “overhang” will help ease the premium of long-term over short-term prices in the futures market, the secretary general said. This structure, known as contango, encourages traders to hoard inventories that can further depress prices for near-term contracts. Supply cutbacks have left the group with idle capacity of around 7 million to 8 million barrels a day, which is unlikely to fall before the end of the year, el-Badri said. It would take a “dramatic” event for OPEC to meet before its next scheduled conference on Sept. 9, he said. The group will then next gather on Dec. 17 in Luanda, capital of Angola, which holds OPEC’s rotating presidency. The price recovery in recent months has not changed OPEC’s plans to push back 35 of about 120 new supply projects until after 2013, as exploration and production costs have not fallen more than 8 percent, el-Badri said. The “marginal cost for alternative energy” is $70 a barrel, he said. Additional supplies from outside the organization will be even more constrained, el-Badri said. There will be “zero” production growth from non-OPEC suppliers over the next 5 to 10 years as output in Mexico, Russia and the North Sea stagnates, he said. June 5 (Bloomberg) -- Crude oil was little changed after rising to a seven-month high yesterday as Goldman Sachs Group Inc. said prices may reach $85 a barrel by the end of the year as demand recovers and supplies shrink. Oil climbed more than 4 percent yesterday and gasoline surged after the bank increased its year-end forecast from $65 and withdrew a prediction that prices will dip prior to a rally. U.S. stocks rose for a fifth time in six days, outweighing a slump in retailers following disappointing May sales. “If this trend continues where the market goes up, even on bad news and oil goes up with the market, then oil could easily hit $90 this year,” said Mike Sander, an investment adviser at Sander Capital Advisors Inc. in Seattle. Crude oil for July delivery rose 4 cents to $68.85 a barrel on the New York Mercantile Exchange at 8:50 a.m. Yesterday, the contract rose $2.69, or 4.1 percent, to settle at $68.81, the highest settlement since Nov. 4. It was the biggest gain since May 18. Gasoline for July delivery rose 6.05 cents, or 3.2 percent, to end the session at $1.9621 a gallon in New York. It was the highest settlement since Oct. 9. The Standard & Poor’s 500 Index climbed 1.2 percent and the Dow Jones Industrial Average rose 0.9 percent. Retailers from Macy’s Inc. to Costco Wholesale Corp. dropped after sales in May tumbled as higher unemployment curtailed spending. Oil posted its biggest monthly gain in a decade in May on speculation a global economic recovery will trigger a rebound in demand. A drop in the value of the dollar also drew investors to crude and other commodities as an alternative investment. “As the financial crisis eases, an energy shortage lies ahead,” Goldman analysts Jeffrey Currie in London and David Greely in New York wrote in a research report e-mailed yesterday. The bank set a 12-month price target of $90 a barrel, up from $70, and introduced a forecast of $95 for the end of 2010. Goldman’s New York-based energy equities research team, led by analyst Arjun Murti, in March 2005 correctly predicted a “super spike” in prices. In May last year, Murti said oil may rise to between $150 and $200 a barrel within two years. The team revised its forecast after prices then slumped from a record $147.27 in July. Oil will probably climb to a year-end range of $70 to $75 a barrel, Organization of Petroleum Exporting Countries Secretary General Abdalla el-Badri said yesterday in London. Crude’s rally is being driven by a weaker dollar and optimism for an economic recovery, he said. Reduced spending on energy threatens to slow the economy, trigger a surge in prices and hurt future prosperity, the Group of Eight industrialized nations said in the concluding statement at a meeting in Rome on May 25. Oil companies’ spending this year dropped almost $100 billion, or 21 percent, according to a report last month from the International Energy Agency. A government report yesterday showed that U.S. crude-oil inventories unexpectedly rose last week as fuel consumption dropped. Crude-oil supplies climbed 2.9 million barrels to 366 million in the week ended May 29, according to the Energy Department. A 1.5 million-barrel decline was forecast in a Bloomberg News survey. The gain occurred as imports jumped 9.9 percent and refineries increased operating rates to the highest in six months. Fuel demand fell 900,000 barrels to 17.7 million barrels a day last week, the lowest since May 1999. Brent crude for July delivery rose $2.83, or 4.3 percent, to end yesterday’s session at $68.71 a barrel on London’s ICE Futures Europe exchange. It was the highest settlement since Oct. 21. June 5 (Bloomberg) -- The yen headed for a third weekly loss versus the euro before a U.S. report that is estimated by economists to show employers cut fewer jobs last month as the deterioration in the labor market slows. Europe’s single-currency traded near the strongest level since December against the dollar after European Central Bank President Jean-Claude Trichet said the region’s economic performance will improve this year. Australia’s dollar is poised for a third week of advances versus the yen on speculation rising commodity prices will lure investors to the currency. The yen traded at 136.88 per euro as of 8:58 a.m. in Tokyo, from 136.97 yesterday in New York. It is headed for a 1.4 percent decline versus Europe’s single currency. The yen traded at 96.61 per dollar from 96.58 yesterday, when it reached 96.97, the weakest in four days. The euro bought $1.4165 from $1.4183. It reached $1.4338 on June 3, the strongest level since Dec. 29. Australia’s dollar traded at 77.31 yen from 77.44 and fell 0.2 percent to 80 U.S. cents. Crude oil for June delivery yesterday rose to a seven-month high of $69.60 per barrel. The yen may weaken to 150 per euro by the end of this year, Calyon’s Kato said. U.S. employers probably cut 520,000 jobs in May, less than the previous month’s 539,000 decline, according to a Bloomberg survey of economists before today’s Labor Department report. The number of workers filing first-time jobless claims fell in the week ended May 30, a report showed yesterday. The euro strengthened versus 13 of its 16 major currencies this week as the European Central Bank kept interest rates at an all-time low of 1 percent after reducing them last month. The central bank plans to start buying covered bonds next month to hold down borrowing costs and complete the 60 billion euro ($85 billion) program in June 2010, Trichet told reporters in Frankfurt yesterday. The euro gained 5.8 percent against the dollar since the ECB last met on May 7 as economic reports added to evidence the most acute phase of the recession passed, damping demand for the U.S. currency as a refuge. The Dollar Index fell yesterday on speculation nations are considering alternatives to the world’s main reserve currency. Russian President Dmitry Medvedev reiterated concerns about the dollar’s role as the world’s reserve currency and said an alternative may help to create a new global financial architecture, in an interview with Kommersant newspaper published today. The Dollar Index, used by the ICE to track the greenback against the euro, yen, pound, Swiss franc, Canadian dollar and Swedish krona, fell 0.2 percent to 79.357 yesterday. FKLI May futures contract surge 14 point higher to close at 1068 as compare to previous trading session with total 6,328 lots traded in the market. FKLI surge up during trading session despite Dow Jones closed weak on overnight trading as most of regional indices bounce up after been plunge for 2 consecutive days. FCPO 3rd month August Futures contract fall marginally RM6 lower to close at RM2569 levels as compare to previous trading session with 7,837 lots traded in the market. CPO price rebound as electronic trading surge high during the trading session despite opened lower as overnight crude oil and soybean oil were close weak. Technically, CPO seems starts to rebound 61.8% Fibonacci rebound level after manage to complete 300% Fibonacci projection levels at RM2525. Based on our technical, we suggest CPO price still riding on bear rally provided resistance levels at RM2600 and RM2640 were not violated. Traders were advice to hold short position in the coming trading session while be cautious around support levels at RM2525 and RM2480 regions. June 4 (Bloomberg) -- Crude oil was little changed near $66 a barrel after falling the most in two weeks yesterday as a government report showed that U.S. supplies unexpectedly increased as fuel consumption plunged to a 10-year low. Inventories climbed 2.9 million barrels to 366 million in the week ended May 29, according to the Energy Department. The gain occurred as imports surged 9.9 percent and refineries increased operating rates to the highest level in six months. Fuel demand fell to the lowest since May 1999. Weaker U.S. stocks also weighed on oil prices. Crude oil for July delivery dropped 17 cents to $65.95 a barrel on the New York Mercantile Exchange at 10:09 a.m. in Sydney. Yesterday, the contract fell $2.43, or 3.5 percent, to settle at $66.12 a barrel, the biggest decline since May 15. Prices jumped $7.53 between May 21 and June 1, the longest rally in a year, as the weakening dollar bolstered the appeal of energy and metals futures as an alternative investment and equities rose. The Energy Department report was forecast to show that crude-oil stockpiles fell 1.5 million barrels, according to the median of 15 estimates by analysts surveyed by Bloomberg News. All 10 industries in the S&P 500 retreated as Federal Reserve Chairman Ben S. Bernanke told lawmakers that large U.S. budget deficits threaten financial stability and the government can’t continue indefinitely to borrow at the current rate to finance the shortfall. “Chairman Bernanke’s sober words helped drop the S&P 500 by over 2 percent at times during the day, helping put pressure on oil to trade lower,” Sander said. The S&P 500 slid 1.4 percent and the Dow Jones Industrial Average 0.8 percent. U.S. fuel demand fell 900,000 barrels to 17.7 million barrels a day last week, the biggest decrease since the week ended Jan. 9, the report showed. Gasoline consumption slipped 518,000 barrels to 9.02 million, the biggest decline since January 2005. Gasoline stockpiles fell 215,000 barrels to 203.2 million last week, the report showed. A 650,000-barrel increase was forecast in the Bloomberg News survey. The peak U.S. gasoline demand period lasts from late May’s Memorial Day holiday until Labor Day in early September as Americans take to the highways for vacations. Gasoline for July delivery fell 0.75 cents to $1.8941 a gallon at 10:09 Sydney time in New York. Yesterday, it dropped 2.36 cents, or 1.3 percent, to end the session at $1.9016 a gallon. It was the biggest decline since May 15. Refineries operated at 86.3 percent of capacity, up 1.2 percentage points from the previous week and the highest since the week ended Dec. 5, the report showed. In addition to supplies on land, traders have kept as much as 100 million barrels of crude oil on tankers. BP Plc, Royal Dutch Shell Plc and Hess Corp. were among oil companies whose first-quarter earnings were boosted by storing crude in tankers. By anchoring vessels offshore, companies were able to profit from the so-called contango, in which oil contracts for delivery in the future are more expensive than near-term supply. Commodity prices also dropped because the dollar snapped four days of losses against the euro as investors flocked to safety. The dollar traded at $1.4158 per euro at 6:16 a.m. in Tokyo, after climbing 1 percent yesterday in New York in its first advance in five days. The Reuters/Jefferies CRB Index of 19 raw materials fell 2.8 percent to 253.05, the biggest drop since April 20. Brent crude for July delivery rose 9 cents to $65.97 a barrel on London’s ICE Futures Europe exchange at 10:03 a.m. in Sydney. It dropped $2.29, or 3.4 percent, to end yesterday’s session at $65.88 a barrel, the biggest decline since April 20. June 3 (Bloomberg) -- Gold fell the most in almost two months as the rebounding dollar curbed demand for the metal as an alternative investment. Silver also declined. The U.S. Dollar Index, a six-currency gauge of the greenback’s value, rose for the first time in a week as investors sought the currency’s refuge after equities fell. Gold typically moves in the opposite direction of the dollar index, which yesterday fell to the lowest since Dec. 18. Gold futures for August delivery tumbled $18.80, or 1.9 percent, to $965.60 an ounce on the New York Mercantile Exchange’s Comex division. That’s the steepest drop for a most- active contract since April 6. Gold earlier touched $992.10, the highest since Feb. 24. Silver futures for July delivery fell 64.5 cents, or 4 percent, to $15.31 an ounce in New York, the sharpest decline for a most-active contract since April 28. Earlier, the metal reached $16.25, the highest price since Aug. 7. Bullion for immediate delivery in London fell $18.82, or 1.9 percent, to $963.03 an ounce at 7:22 p.m. local time. The metal slipped to $976.75 in the afternoon “fixing” in London, used by some mining companies to sell their output, from $980 at yesterday’s afternoon fixing. Gold futures last topped $1,000 on Feb. 20. The metal still has gained 9.2 percent this year as governments around the world sell more bonds to combat the recession, weakening currencies and potentially sparking future inflation. The 10-year U.S. breakeven rate, a gauge of inflation expectations, climbed above 2 percent for a second day today, signaling investors are concerned that consumer prices may accelerate. The extra yield investors demand to hold nominal securities instead of Treasury Inflation Protected Securities, or TIPS, rose to almost 2.03 percent today, the highest level since September. Investment in the SPDR Gold Trust, the biggest exchange- traded fund backed by bullion, remained at a record 1,134.03 metric tons as of yesterday, the company’s Web site showed. “Maybe there will be a little bit of consolidation” today, Wrzesniok-Rossbach said. “I don’t think we’ve seen the highs of the current rally” and gold will likely reach $1,000 “in a matter of days,” he said. June 4 (Bloomberg) -- The dollar and the yen may rise for a second day versus the euro on speculation an economic recovery will be too weak to sustain gains in higher-yielding assets such as stocks, encouraging demand for safety. The dollar advanced versus 10 of the 16 most-traded currencies today after reports yesterday showed U.S. companies cut more jobs last month than economists forecast and Europe’s economy contracted at the fastest pace in 13 years. Japanese companies cut spending for an eighth straight quarter, the Ministry of Finance said today. The euro was little changed before today’s European Central Bank meeting at which policy makers are due to disclose details of plans to buy covered bonds. “The financial market has become overly optimistic about the global economy,” said Robert Rennie, chief currency strategist at Westpac Banking Corp. in Sydney. That is why the dollar and the yen may strengthen today, he said. The dollar traded at $1.4156 per euro as of 9:05 a.m. in Tokyo, from $1.4162 yesterday in New York, when it climbed 1 percent. The yen was at 135.87 per euro from 135.93 yesterday. The dollar bought $1.6312 per British pound from $1.6317 and was little changed at 95.97 yen from 95.99 yen. The U.S. currency may strengthen to as high as $1.4050 per euro today, Rennie said. The VIX Index, a measure of market volatility known as Wall Street’s “fear gauge,” rose 4.7 percent yesterday, the most in a week, to 31.02, indicating traders are becoming less confident in stock-market advances. Europe’s Dow Jones Stoxx 600 Index slipped 2 percent yesterday after the European Union’s statistics office reported the euro area’s economy contracted 2.5 percent in the first quarter, the most since the data were first compiled in 1995. ECB policy makers will hold the main refinancing rate at 1 percent at today’s meeting, according to the median forecast of economists surveyed by Bloomberg News. The ECB said last month it would buy 60 billion euros ($85 billion) of covered bonds, debt issued by banks and backed by mortgages or public-sector loans. Demand for the dollar may increase after Federal Reserve Chairman Ben S. Bernanke said large U.S. budget deficits threaten financial stability and the government can’t continue indefinitely to borrow at the current rate. “Bernanke told Congress that the Fed won’t accommodate wider budget deficits by simply printing money, clearly attempting to reassure foreign investors worried about the U.S. dollar’s ‘safe haven’ status,” John Kyriakopoulos, Sydney-based head of currency strategy at National Australia Bank Ltd. wrote in a research report. A government report tomorrow will show the U.S. jobless rate rose to 9.2 percent in May, the highest in more than 25 years, according to a Bloomberg survey of economists. ADP Employer Services yesterday reported U.S. companies cut 532,000 jobs last month. The median forecast of economists surveyed by Bloomberg News was for a reduction of 525,000. Japanese capital spending excluding software dropped 25.4 percent in the quarter ended March 31 from a year earlier, compared with an 18.1 percent decline the previous three months, the Ministry of Finance said in Tokyo. FKLI May futures contract fall another 8 point lower to close at 1054 as compare to previous trading session with total 6,329 lots traded in the market. FKLI seems consolidate before starts falling due to sudden change of regional equity indices towards south. 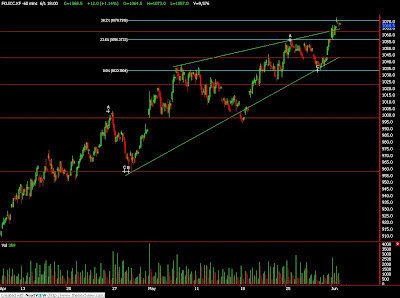 Technically, FKLI seems closed on top of 100% Fibonacci projection levels at 1053.5 regions after manage to rebound 78.6% at 1068.5 regions during the trading session. 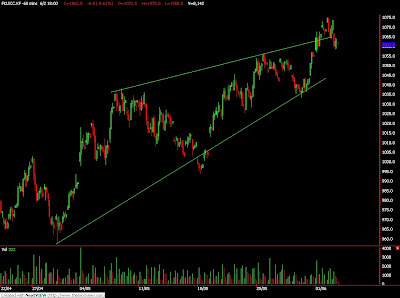 Based on our technical knowledge, we suggest FKLI likely to trade towards south in the coming trading session where support seen at 1049 and 1033.5 regions. Traders were advice to hold short position in the coming trading session while be cautious around resistance levels at 1060 and 1073 regions. FCPO 3rd month August Futures contract fall RM2 to close at RM2575 levels as compare to previous trading session with 6,908 lots traded in the market. CPO price seems fails to sustain continues buying interest as soybean oil and crude oil electronic trading retrace after closed firm during overnight trading. 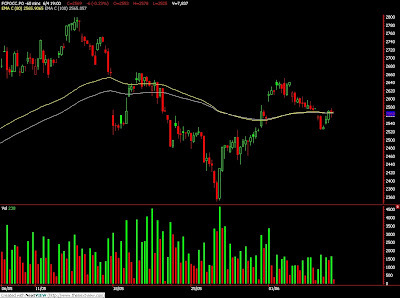 Technically, CPO price been traded sideways towards downside as in the 15 min price chart. Our technical knowledge suggest us that CPO price currently undergoing correction where resistance levels were seen at RM2610 and RM2654 regions. Traders were advice to hold short position in the coming trading session while be cautious around support levels at RM2544 and RM2520 regions. June 3 (Bloomberg) -- Palm oil futures in Malaysia dropped for a second day on concern that imports by India, the largest buyer of cooking fat after China, will slow. India may slow the pace of purchases after stockpiles surged on record imports, Govindlal G. Patel, who has traded vegetable oil for four decades, said in an interview yesterday. Edible oil reserves probably rose 55 percent to 1.7 million metric tons in the seven months to May, on year, he said. “The market looks ahead -- 2010 crude palm oil price is almost certain to be lower than this year” barring weather surprises, Alvin Tai, an analyst at OSK Research Sdn., wrote in an e-mail referring to the Indian impact on prices. Palm oil for August delivery on the Malaysia Derivatives Exchange fell as much as 0.8 percent to 2,577 ringgit ($741) a ton. It traded at 2,581 ringgit at the 12:30 p.m. break. Indian buying had helped Malaysia’s palm oil stockpiles in April decline to 1.29 million tons, the lowest since June 2007 and 43 percent lower than November’s record of 2.27 million tons, according to data from the nation’s Palm Oil Board. Reserves in Indonesia, the No.1 producer, have fallen to less than 1 million tons, Palm Oil Board Deputy Chairman Derom Bangun said on May 29. Palm oil has rallied 52 percent this year on concern that the supply of soybeans, crushed to produce soybean oil, may drop in Argentina due to drought, and as U.S. stockpiles are forecast at a five-year low. Soybean oil is a rival oil and substitute and lower supplies could boost palm oil demand. Soybeans for July delivery in Chicago dropped 0.4 percent to $12.0375 a bushel at 12:33 p.m. Singapore time, while soybean oil eased 0.9 percent to 40.12 cents a pound. The palm oil rally may cool to between 2,550 ringgit and 2,800 ringgit a ton for the next two months, Rafdi Prima, a technical analyst at PT Mandiri Sekuritas, said yesterday. The commodity may drop as low as $580 a ton if crude oil tumbles to $45 a barrel by November should the world economic recovery falter, according to James Fry, an economist at LMC International Ltd., which tracks the world’s main oilseeds. China, the biggest user, may slow buying, Fry said on May 29. Palm oil in Dalian dropped for the first time in three days today, easing 0.6 percent to 6,918 yuan ($1,013) a ton at the 11:30 a.m. trading pause. It had exceeded 7,000 yuan yesterday for the first time since May 13. Crude oil in New York was little changed at $68.54 a barrel at 12:11 p.m. in Singapore. Crude prices, which have advanced 54 percent this year, can influence trends in palm oil as the vegetable oil can be used to make biofuel. There are more than 200 million barrels of excess crude in the market in addition to 130 million barrels held on tankers at sea, Hasan Qabazard, Director of Energy Research at the Organization for Petroleum Exporting Countries, said yesterday. This “overhang” of oil was more than the five-year average, he said. Still, it may clear if an economic recovery spurs demand by the year’s end, he added. The International Energy Agency forecast in May that 2009 will see the biggest drop in world oil use since 1981. A day earlier, OPEC cut its outlook for 2009 demand for a ninth month. June 3 (Bloomberg) -- Crude oil fell in New York as traders sold contracts to lock in gains after prices reached a seven- month high yesterday as investors sought to purchase commodities as a hedge against inflation. Oil had gained late in trading yesterday as the dollar declined on speculation record U.S. borrowing will undermine the currency. Investors who made bets that prices will rise, or so- called long positions, need to sell their contracts to record profits. From May 15, crude surged 23 percent to yesterday’s intraday high of $69.05 a barrel, the most since Nov. 5. Crude oil for July delivery fell as much as 57 cents, or 0.8 percent, to $67.98 a barrel on the New York Mercantile Exchange. It was at $68.15 a barrel at 8:03 a.m. Singapore time. The contract fell 3 cents yesterday to settle at $68.55 a barrel. Prices are up 53 percent this year. The euro gained for a fourth day versus the dollar yesterday as the Russian government said emerging-market leaders may discuss the idea of a supranational currency at a meeting this month. The dollar fell 1.2 percent to $1.4329 per euro, earlier touching $1.4331, the weakest level since Dec. 29. U.S. fuel demand over the past 4 weeks averaged 18.3 million barrels a day, the Department of Energy said on May 27. That’s down 11 percent from the same period last year. The International Energy Agency on May 14 forecast that this year will see the biggest contraction in world oil use since 1981. On the previous day, the Organization for Petroleum Exporting Countries cut their outlook for 2009 demand for a ninth straight month. U.S. crude-oil stockpiles probably dropped 1.5 million barrels in the week ended May 29 from 363.1 million the previous week, according to the median of 15 estimates by analysts before an Energy Department report tomorrow. Inventories are likely to have fallen as refiners increased operations to meet demand during the summer driving season. Stockpiles of gasoline probably rose 650,000 barrels from 203.4 million the prior week, according to the survey. Supplies of distillate fuel, a category that includes diesel and heating oil, increased 900,000 barrels from 148.4 million. Crude oil inventories fell 828,000 barrels to 363.9 million last week, the industry-funded American Petroleum Institute said late yesterday. Oil-supply totals from the API and DOE moved in the same direction 76 percent of the time over the past four years, according to data compiled by Bloomberg. API collects stockpile information on a voluntary basis from operators of refineries, bulk terminals and pipelines. The government requires that reports be filed with the Energy Department for its weekly survey. Brent crude for July fell 42 cents, or 0.6 percent, to $67.75 a barrel at 8:14 a.m. in Singapore. Yesterday, it rose 20 cents, or 0.3 percent, to $68.17 a barrel on London’s ICE Futures Europe exchange, the highest settlement since Oct. 21. June 3 (Bloomberg) -- The yen and dollar advanced against the euro before a U.S. report that economists said will show payrolls fell last month, spurring demand for the relative safety of the two currencies. The yen advanced versus all 16 of the most-traded currencies as the ADP Employer Services report may show U.S. jobs fell by 525,000 in May, after dropping 491,000 in April, according to a Bloomberg News survey. The yen also gained versus the dollar after Russian President Dmitry Medvedev said a new supranational currency could lay the foundations for a future financial system, suggesting an end to the current role of the greenback as the world’s reserve currency. 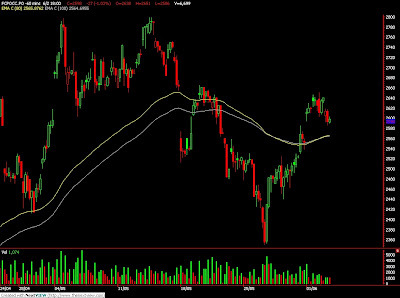 “People are cutting short positions on the yen in a hurry before major economic events in the U.S., which may drive the market’s direction,” said Shoichi Handa, senior currency dealer at SBI Liquidity Markets Co., a unit of financier SBI Holdings Inc. “If the ADP report today contains a negative surprise, the yen may be bought actively against cross currencies.” A short position is a bet an asset will decline. The yen rose to 136.39 per euro as of 9:09 a.m. in Tokyo from 136.97 in New York yesterday. The dollar climbed to $1.4288 per euro from $1.4303, after falling to $1.4331 yesterday, the weakest level since Dec. 29. Then yen gained to 95.44 per dollar from 95.76. The Dollar Index, used by the ICE to track the greenback against the euro, yen, pound, Swiss franc, Canadian dollar and Swedish krona, rose 0.2 percent to 78.528. The Index fell yesterday as the Russian government said emerging-market leaders may discuss the idea of a supranational currency. Medvedev has repeatedly called for creating regional reserve currencies to address the global financial crisis. FKLI May futures contract retrace 6.5 point lower to close at 1062 as compare to previous trading session with total 8,142 lots traded in the market. FKLI losses buying power due to regional indices plunge during trading session despite Dow Jones closed firmed during overnight trading session. 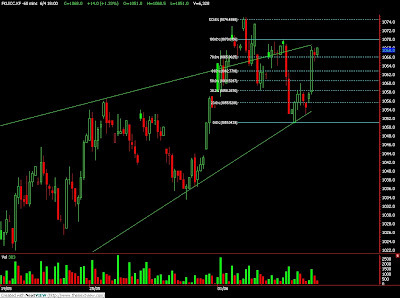 Technically, FKLI daily price chart forms at bear engulfing but lack of more traded volume for more confirmation. Our technical knowledge suggests that FKLI already forms head and shoulder in the hourly chart while temporary supports were seen at 1058.5 and 1054 regions. Traders were advice to hold short position in the coming trading session while take precautious around resistance levels at 1073 and 1081 regions. FCPO 3rd month August Futures contract fall RM27 to close at RM2598 levels as compare to previous trading session with 6,699 lots traded in the market. CPO price seems fails to sustain continues buying interest as soybean oil and crude oil electronic trading retrace after closed firm during overnight trading. Technically, CPO price seems topped around resistance levels at RM2650 regions after tested for 3 times in the hourly chart. Our technical knowledge suggests that CPO price still riding on a bear market in the medium term where resistance still seen at RM2650 and RM2703 region despite of strong fundamental support on the strong demand. Traders were advice to hold short position in the coming trading session while be cautious around support levels at RM2560 and RM2500 regions. June 2 (Bloomberg) -- India, the world’s second-biggest buyer of vegetable oils, may slow imports in the coming months after stockpiles surged on record purchases, Govindlal G. Patel, director of Dipak Enterprise, said. Edible oil reserves probably rose 55 percent to 1.7 million metric tons in the seven-month period ended May, topping normal levels of 1.1 million tons, Patel said in a phone interview from Rajkot in western India today. Lower purchases by the South Asian nation may help cool a 56 percent rally in crude palm oil in Malaysia this year. Prices of the commodity have surged as soybean crops decline in Brazil and Argentina, and inventories in the U.S. are forecast to reach a five-year low. Palm oil and soybean oil are substitutes. August-delivery palm oil rose 0.6 percent to 2,640 ringgit a ton at the 12:30 p.m. break on the Malaysia Derivatives Exchange. Earlier, futures gained as much as 1 percent. The price may reach 3,000 ringgit by August as a drop in soybean oil supplies boosts demand for palm oil, Patel said. India may have purchased more than 800,000 tons of edible oils last month, including 700,000 tons of refined and crude palm oils, Patel said. Imports in May 2008 were 302,345 tons, data from the Solvent Extractors’ Association of India shows. Cooking oil imports surged 82 percent in the six months to April 30 after the government scrapped import tax amid a decline in local oilseed output. India in March scrapped a 20 percent duty on imports of crude soybean oil four months after it was imposed to shield oilseed growers. Crude palm oil can be imported tax-free. Production of oilseeds may drop to 28.12 million tons in the year ending June, down from 29.75 million tons a year earlier, the agriculture ministry said last month. Edible oil imports may exceed 8 million tons in the year to October, from 5.6 million tons a year ago, Patel said. The nation may buy about 500,000 tons of non-edible vegetable oils, he said. India relies on overseas purchases to meet almost half its edible-oil demand. It buys palm oil from Indonesia and Malaysia, and soybean oil from Argentina and Brazil. Palm oil accounts for almost 90 percent of all edible oil imports. June 2 (Bloomberg) -- Crude oil retreated from a seven- month high in New York on signs OPEC’s output is climbing and as traders who bet on rising prices sell futures to lock in gains. Oil jumped as much as 3.6 percent yesterday, capping a 12 percent increase since May 21, after the U.S. and China reported increases in manufacturing activity. The Organization of Petroleum Exporting Countries raised their production by 1.5 percent in May, according to a Bloomberg News survey. Crude oil for July delivery fell as much as 99 cents, or 1.4 percent, to $67.59 a barrel on the New York Mercantile Exchange. It was at $67.89 a barrel at 3:02 p.m. Singapore time. Yesterday, oil closed at $68.58 a barrel, the highest settlement since Nov. 4. Prices are up 53 percent this year. Futures climbed yesterday on expectation that fuel demand will increase as the economy improves later this year. The Institute for Supply Management’s U.S. factory index rose to 42.8 from 40.1 in April and China’s Purchasing Manager’s Index showed manufacturing in May gained for a third month. Fuel demand during the U.S. summer driving season may prove stronger than projected as consumers recover from the shock of the global financial crisis, Richard Jones, deputy executive director of the International Energy Agency, said yesterday. Economists expected the ISM’s U.S. manufacturing index to climb to 42.3, according to the median of responses in a Bloomberg News survey. Readings of less than 50 on the Tempe, Arizona-based group’s gauge signal a contraction. The U.S. and China are the biggest oil-consuming countries, responsible for 33 percent of global demand in 2007, according to BP Plc, which publishes its BP Annual Statistical Review of World Energy each June. OPEC’s oil production averaged 28.15 million barrels a day last month, up 405,000 barrels a day from April, according to the survey of oil companies, producers and analysts. The 11 OPEC members with quotas, all except Iraq, pumped 25.76 million barrels a day, 915,000 more than their target. U.S. crude-oil stockpiles probably dropped 1.75 million barrels in the week ended May 29 from 363.1 million the previous week, according to the median of eight estimates by analysts before an Energy Department report this week. Inventories likely fell as refiners increased their operations to meet demand during the summer driving season. Refineries probably operated at 85.5 percent of capacity last week, up 0.4 percentage point from the previous week, according to the median of responses in the survey. News survey showed. Plant rates climbed 3.3 percentage points in the week ended May 22, the biggest gain since October, according to the Energy Department. Operating rates increased during the last week in May in every year but one since 2000. Brent crude for July settlement fell as much as 92 cents, or 1.4 percent, to $67.05 a barrel and was at $67.37 on London’s ICE Futures Europe exchange at 3:03 p.m. Singapore time. June 2 (Bloomberg) -- Crude oil traded near $68 a barrel after rising to the highest level since November yesterday as China’s manufacturing expanded and U.S. industrial output shrank less than forecast, signaling that fuel demand may increase. Oil gained as much as 3.6 percent yesterday and equities rallied as the Institute for Supply Management’s U.S. factory index strengthened to 42.8 from 40.1 in April and after China’s Purchasing Manager’s Index showed manufacturing in May climbed for a third month. A government report tomorrow will probably show that U.S. oil inventories dropped for a fourth week. Crude oil for July delivery fell 68 cents to $67.90 a barrel on the on the New York Mercantile Exchange at 9:03 a.m. in Sydney. Yesterday, oil advanced $2.27, or 3.4 percent, to $68.58, the highest settlement since Nov. 4. Prices are up 52 percent this year. The Standard & Poor’s 500 Index increased 2.6 percent to 942.87, its highest close since November. The Dow Jones Industrial Average climbed 2.6 percent to 8,721.44. U.S. crude-oil stockpiles probably dropped 1.75 million barrels in the week ended May 29, according to the median of eight estimates by analysts before tomorrow’s Energy Department report. Technical traders watch for patterns on charts for clues to price direction, and may sell or buy based on those signals. Oil’s rally may reach $78 a barrel should prices close above their 200-day moving average, according to technical analysis by PVM Oil Associates Ltd. The July crude contract rose to its 200-day mean on May 29, a signal that prices may keep rising, PVM said in a report today. If the contract settles above the rolling average, currently around $66.39 a barrel, oil may proceed to $78.40, the broker said. The dollar traded at $1.4163 per euro at 6:10 a.m. in Tokyo. It touched $1.4246 yesterday, the weakest level since Dec. 29. BNP Paribas raised its West Texas Intermediate crude-oil forecast for 2010 by $12 a barrel, to an average of $75, according to a report today by analyst Harry Tchilinguirian in London. The West Texas grade is the U.S. benchmark and is traded in New York. The peak U.S. gasoline consumption period lasts from late May’s Memorial Day holiday until Labor Day in early September, as Americans take to the highways for vacations. Gasoline for July delivery rose 2.9 cents, or 1.5 percent, to end the session at $1.9243 a gallon in New York, the highest settlement since Oct. 9. The Organization of Petroleum Exporting Countries increased oil output by 1.5 percent in May, the biggest gain since October 2007, as members took advantage of higher prices, a Bloomberg News survey showed. Oil production averaged 28.15 million barrels a day last month, up 405,000 from April, according to the survey of oil companies, producers and analysts. The 11 OPEC members with quotas, all except Iraq, pumped 25.76 million barrels a day, 915,000 more than their target. Brent crude for July settlement rose $2.45, or 3.7 percent, to end yesterday’s session at $67.97 a barrel on London’s ICE Futures Europe exchange. It was the highest settlement since Oct. 21. June 2 (Bloomberg) -- The yen strengthened against the euro on speculation Japanese exporters bought the currency to bring home overseas earnings after it fell to the lowest level in eight weeks. The yen also advanced versus the dollar after yields on U.S. Treasuries surged by the most in eight months yesterday on concern the U.S. government’s increasing debt load will jeopardize its top credit rating. The yen rose to 136.19 versus the euro as of 9:13 a.m. in Tokyo after falling 1.4 percent yesterday in New York when it reached 137.24, the weakest since April 6. The yen strengthened to 96.18 per dollar from 96.59. The dollar traded at $1.4149 per euro. It fell to $1.4246 yesterday, the weakest since Dec. 29. FKLI May futures contract rose another 12 point higher to close at 1068.5 as compare to previous trading session with total 9,576 lots traded in the market. FKLI opened higher and continue to trade higher due to speculation on highlights regarding General Motor’s bankruptcy matter. 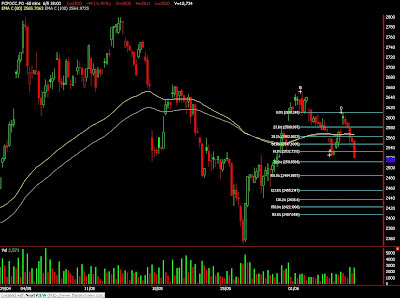 Technically, FKLI seems meet projected figure at 1071; 38.1% Fibonacci projection levels in the hourly chart. Our technical knowledge suggests that FKLI seen topped around resistance levels at 1071 and 1095 regions. Hence, traders were advice to hold short position provided resistance levels were not violated while alert around support levels at 1057 and 1044 regions. FCPO 3rd month August Futures contract surge RM65 to close at RM2625 levels as compare to previous trading session with 8,888 lots traded in the market. CPO price were traded higher throughout entire trading session as soybean oil and crude oil overnight and electronic trading were traded firm and strong which subsequently influence CPO price traded at higher range. Despite CPO price was traded above 50% Fibonacci rebound levels at RM2574 regions during opening, CPO price was still seen flirting around next resistance levels at RM2630 regions. Technically, CPO price was seen temporary holding above support levels at RM2600 and RM2575 region. However, our technical wave count still suggest traders to hold short position in the coming trading session provided resistance levels at RM2703 and RM2800 were able to resist the buying interest during the trading session. MUMBAI, June 1 (Reuters) - Indian soybean and soyoil futures may edge up in early trade on Monday tracking firm Malaysian palm oil and dwindling arrivals in spot markets, analysts said. At 9:31 a.m. the benchmark August palm oil futures KPOc3 on Bursa Malaysia Derivatives Exchange was up 1.99 percent to 2,611 ringgit a tonne. The July soybean contract NSBN9 on the National Commodity and Derivatives Exchange ended at 2,616.5 rupees per 100 kg, while July soyoil NSON9 ended at 494.15 rupees per 10 kg in the previous session. But a likely rise in soybean acreage may limit the gains, they added. June 1 (Bloomberg) -- The yen rose for a second day against the dollar and the euro as speculation General Motors Corp. will file for bankruptcy today spurred demand for Japan’s currency as a refuge from the financial crisis. The yen advanced versus all 16 of the most-traded currencies after people familiar with the matter said GM will make its announcement before 8 a.m. in New York, adding to signs the global recession is far from over. The euro weakened for the first time in three days versus the dolllar on concern policy makers meeting this week will signal they may take more measures to add funds to the economy to keep down borrowing costs. The yen strengthened to 94.92 per dollar as of 10:07 a.m. in Tokyo, from 95.34 in New York last week. Japan’s currency gained to 134.19 per euro from 134.96 last week. The euro declined to $1.4117 from $1.4158, after gaining 7 percent last month, its biggest advance since December. The dollar may fall to as low as 94.25 yen today, Uno said.